I have used NIS for a few years now and on some past versions NIS has turned off Windows firewall and also disabled the windows security notifications so the windows will not keep telling me about the disabled firewall. I noticed in NIS 2010 that both Norton and windows firewall are turned on but do not seem to causing any issues with each other. 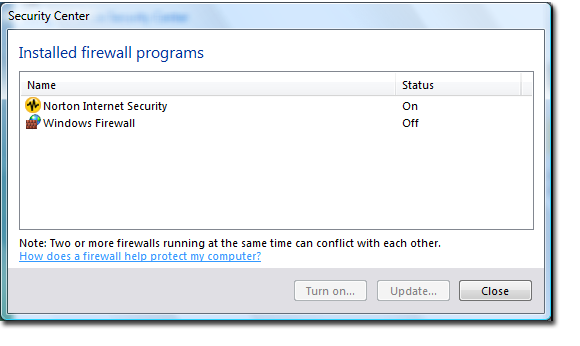 I pretty much let NIS do all of it's default settings so is this normal for NIS to keep Windows firewall turned on? Re: Windows Firewall On with NIS 2010? Windows Firewall should be turned off and NIS firewall should be on. You can go to Start, to Control Panel and then to Security Center. Open Security Center. Under Firewall, NIS firewall should be indicated as on. Interesting, I using XP sp3 and when I installed NIS 2010 it turn windows firewall on (as well as the firewall in NIS 2010). There must be a reason why Norton NIS 2010 did this. I too have not noticed any conflicts. Just wondering if I should turn it off or just leave it as NIS 2010 put it. Could someone from Symantec say what is best? Sorry - forgot to mention that ;-) Vista Home Premium SP1. I'm using Windows XP SP3. But I have Windows Firewall turned OFF after installing NIS 2010. I can confirm that NIS Smart Firewall and Windows Firewall will not be active at the same time. Can you show us any screenshot. May be that should help. I did end up turning off the windows firewall. I installed NIS 2010 on three different XP SP3 machines and for some reason one of them kept the windows firewall as well as the smart firewall on. You may have some malware on that one computer then that is causing the firewall issue. Does not seem to be an issue anymore, I installed NIS 2010 then noticed about a week later that both firewalls were on but did not seem to create an issue. I have since turned off the windows firewall and now only have Norton's Smart Firewall on. One thing that was different with this machine is that I had an issue when I first installed NIS 2010 where I basically had more than one real time scanning malware programs installed, in fact you helped me out on this in a previous post thanks again! But anyway I ended up uninstalling NIS via the Norton removal tool and then reinstalling via the NIS210 download. I DO remember I think after using the Norton Removal Tool Norton saying I should turn ON the Windows firewall until I install a new firewall (forget the exact words used). I then reinstalled via the web and for what ever reason Nortron did not turn off the windows firewall, but as I said the windows firewall does now stay off. Yep thats what I did thanks!, stll not sure why Norton left both on during instal. Oh well can't complain I really like the look and feel of NIS 2010.
this is not an issue of a single computer. I've seen that behaviour on every computer (more than 30 with Windows XP Pro SP3 and a few ones with Vista) on which I installed NIS 2010. But in fact, it never caused a problem running both firewalls at the same time. I have manually deactivated the Windows firewall on all these computers a short time after installing NIS. By the way, even after deactivating the Windows firewall it is still running as a service. You can enter "net start" on the command line or run "services.msc" to verify that. Maybe the service is still running because it is also used for Internet Connection Sharing (that's what the output of "net start" on Windows XP implies). I don't use ICS, but I'm not sure if I can change the starting mode of the Windows firewall service from "automatic" to "manual" or "disabled" without any negative side effect. I've just had the same problem on a PC running Windows 7 64 bit ultimate. Took a while to spot the problem. On Win 7 Windows Firewall needs to be turned on. NIS turns off packet filtering function, WF has other tasks left. I would also like to know how to set the Windows XP (SP3) firewall, when using NIS 2010. In Microsoft Windows XP Service Pack 2 (SP2) , Windows Firewall is turned on by default. (However, some computer manufacturers and network administrators might turn it off.) You do not have to use Windows Firewall—you can install and run any firewall that you choose. Evaluate the features of other firewalls and then decide which firewall best meets your needs. If you choose to install and run another firewall, turn off Windows Firewall." So... I'm leaving it off.